Always having to clean up the mess on the floor caused by kids or dogs? Cereals, food particles, hair, and other small particles? And it takes a long time to clean up using a broom or dustpan? Or you could pull out a vacuum, but it’ll be loud, you’ll need to plug it in, and it’s just bulky and heavy to carry around. This Stainless Steel Sweeping Machine Mop is a rotating hard floor sweeper that does the job of a vacuum in the form of a broom/dustpan, WITHOUT electricity or batteries! Yes, you no longer need a vacuum or replace a vacuum with lousy suction power. It helps you clean easily and saves time and energy. No more worries as it can ensure the health of family members and hygiene! Wide Angle Sweep: 360-degree rotating brush with high-speed rotation to touchdown rubbish dust swept into the dustbin. it is easy to use, even for the children. 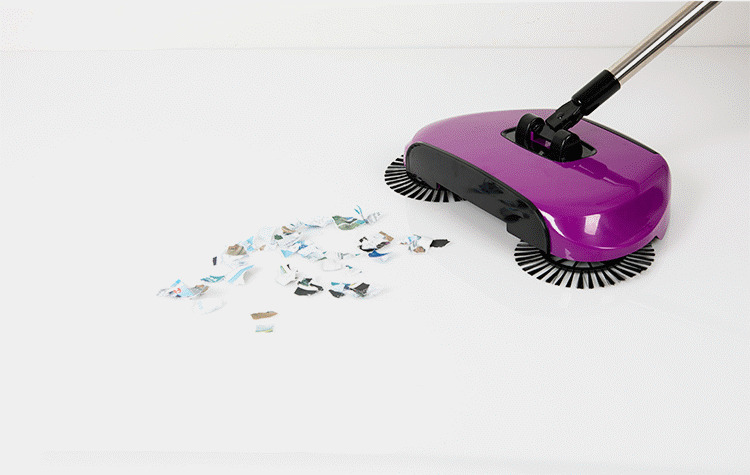 Multi-Functional Sweeper: Come with a broom, dustpan and trash bin 3 in 1. Energy Conservation and Environmental Protection - Without power supply,So when you use ,there is any noisy to make your life more cleaning and quietly. Easy to use: The sweeping machine by using the principle of the mechanical, go ahead, as long as the hands to push and follow it, implement sweeping dust removal. Wide Applicability: It can be used for flat floor such as plastic, wood, ceramic tile, marble, concrete blanket and so on, it is very easy to clean.